The repetition of a singular plant creates a dramatic visual impact. The tough sward shape-leaves of the Agave palmeri is a powerful contrast to Nader Khalili's smooth superadobe house in Pescadero, Mexico. 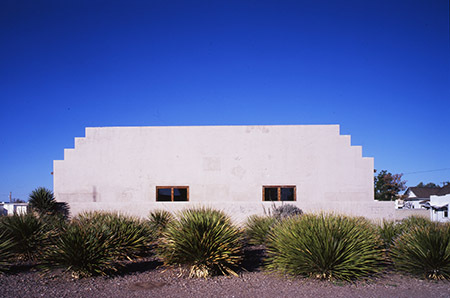 A grid of Texas Sotol [Dasylirion texanum] creates a visually striking and memorable landscape at the Chinati Foundation in Marfa, Texas. At Mark Word Design we use masses to highlight the structure of a particular plant, while simultaneously reducing the overall maintenance of the garden.